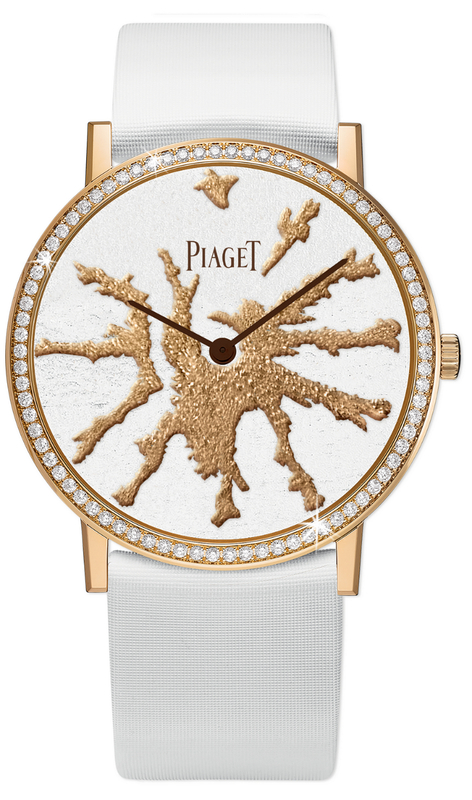 Piaget’s high jewellery collection “Sunlight Escape” brings with it eight beautifully designed Altiplano timepieces that use exceptional Métiers d’Art crafting techniques, including stunning and intricately delicate marquetry, bulino engraving and vivid enamelling. As the collection draws inspiration from the lands of the Northern lights, the dials weave stunning solar visuals and scenes of wildlife into their designs. 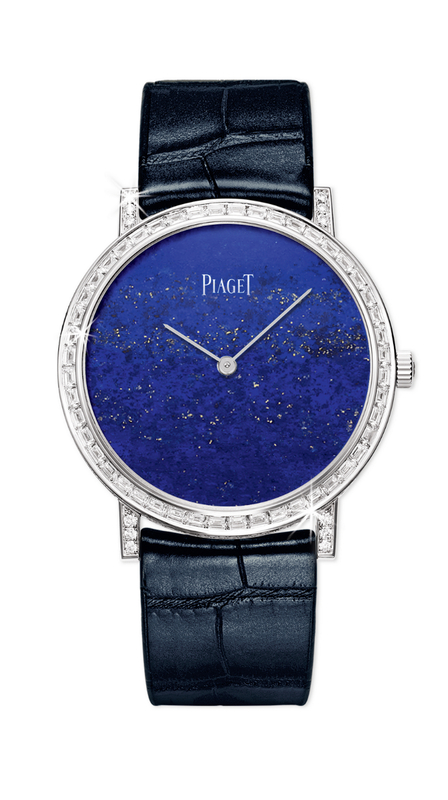 At the core of these eight watches beat the Manufacture Piaget 430P, an ultra-thin hand-wound mechanical movement and noble successor to the hand-wound Piaget 9P. Which one of these limited edition timepieces would you choose? This 38mm-diameter watch is inspired by the Northern lights, with a captivating dial filled with a green glow mixed with blue and deep purple, made possible through exquisite feather marquetry. Small polished white gold parts pepper the dial just as shining stars pepper the Northern lit sky. Limited edition of 18 pieces. A 38mm-diameter watch with a dial featuring white and golden feather marquetry, a champagne alligator strap and a pink gold case with a bezel featuring 78 brilliant-cut diamonds. The different shades of gold are meant to remind us of the dune horizon and the sun’s reflections on snow. Limited edition of eight pieces. 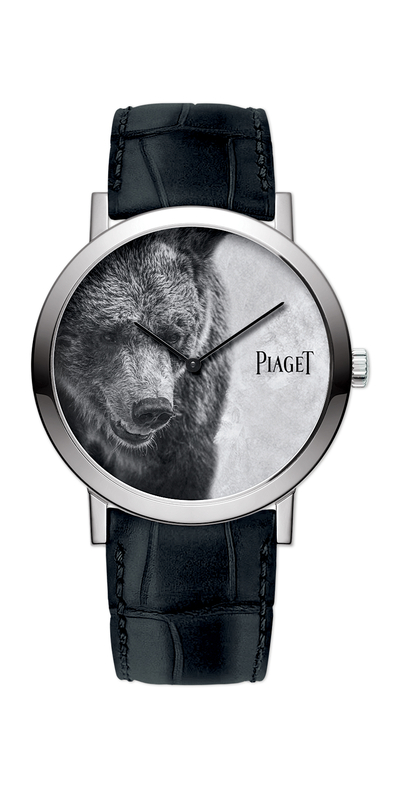 This 41mm watch is inspired by the Nordic lands, AKA “The lands of fire and ice”. 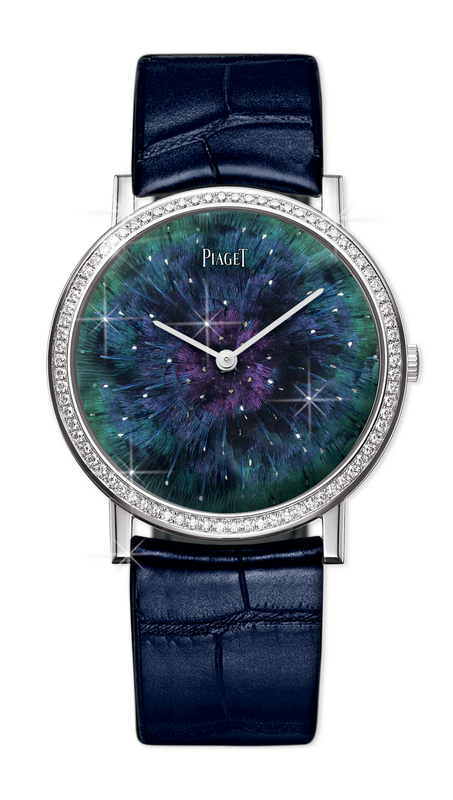 The dial is made of a brilliant blue lapis lazuli stone which recall the pure blue sky in its zenith. The dial is set with 48 baguette-cut diamonds and 102 brilliant-cut diamonds. 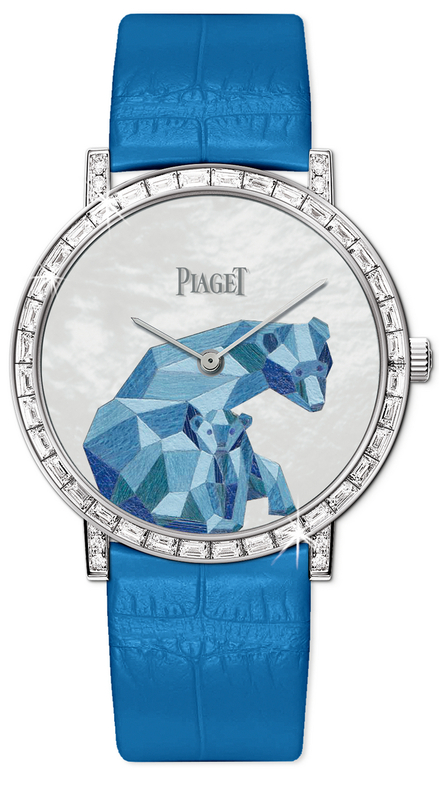 In this blue satin beauty, Piaget decided to capture a time of tenderness experienced between a mother bear and her baby. 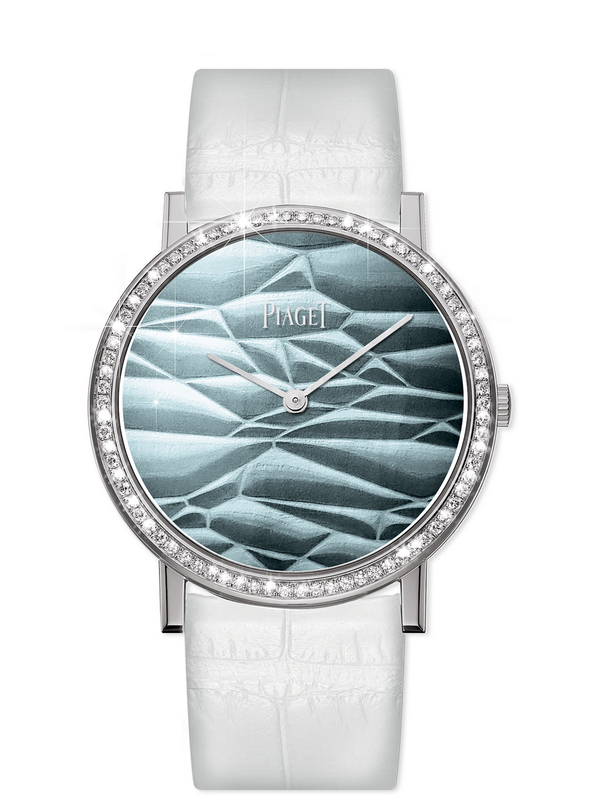 The watch is presented in 36mm white gold case with 48 baguette-cut diamonds and 303 brilliant-cut diamonds on the bezel. 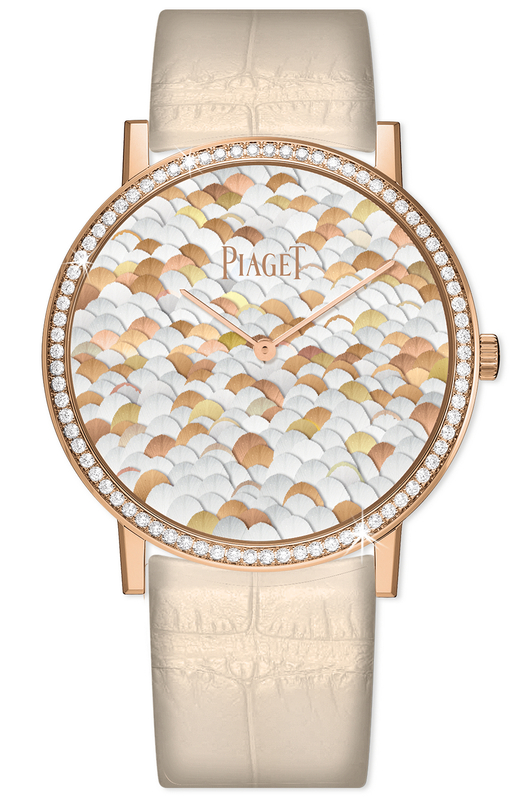 Using the ancient technique of wood marquetry, the motif is made entirely with wood pieces set on a mother-of-pearl dial. Limited edition of eight pieces. 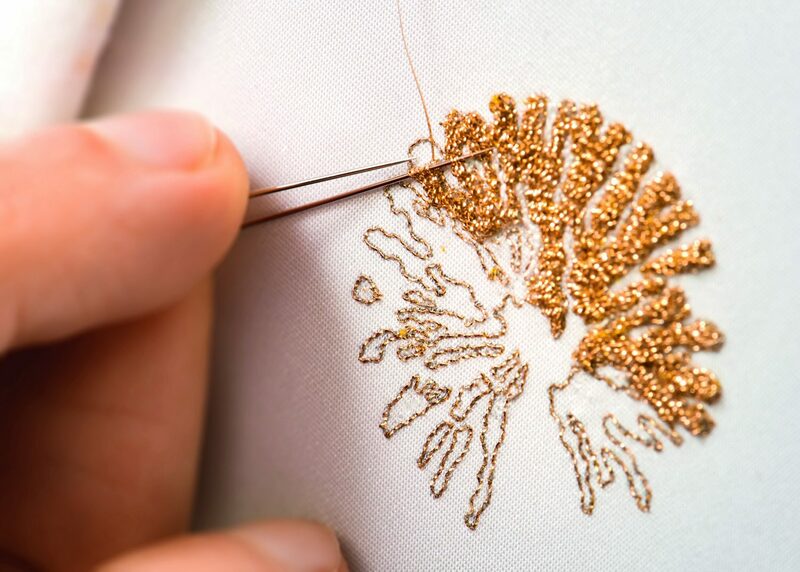 Through bulino engraving, another bear is brought to life and dot by dot, every little detail of its being is captured, almost as if it were a picture of the bear itself. This comes in a 40mm white gold case. Limited edition of eight pieces. Featuring a dial made of chrysoprase, this watch is inspired by the brilliant colour of the aurora borealis – aqua. 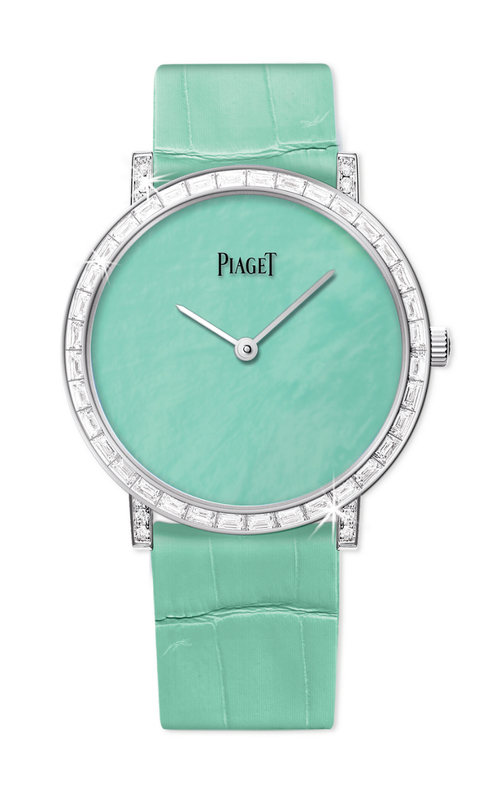 This watch comes in a 36mm white gold case with 48 baguette-cut diamonds and 303 brilliant-cut diamonds on the bezel with a mint alligator strap to match the aqua. This watch, also a 38mm-diameter watch in pink gold case with a bezel featuring 78 brilliant-cut diamonds, is presented on a stunning white silk dial embroidered with a radiant motif in thin pink gold threads, mimicking the sun shining on vast white plains. This comes fitted with a white alligator strap. Limited edition of 18 pieces. This 38mm-diameter watch in a white gold case comes with a blue enamelled engraving dial and white alligator strap, reminding us of the frozen ice that covers the bright blue sea. Limited edition of 18 pieces.